In the fortnight of wall-to-wall media hype dedicated to Super Bowl XLIX, no storyline has gone unturned. From Bill Belichick‘s deflated footballs to Tom Brady‘s nasal congestion to Marshawn Lynch‘s camera shyness, every angle been covered ad nauseam. There are even stories about how it’s not a story that Russell Wilson is starting in the Super Bowl as a Black quarterback. And occasionally, in the midst of the all the hype, we’ve managed to talk a little bit about who is actually going to win Sunday’s championship game between the New England Patriots and Seattle Seahawks. Ordinarily, this time of year would be a time of celebration for NFL commissioner Roger Goodell. This is when the league that the 55-year-old Goodell oversees stands alone as the shining centerpiece of the sports world, crowns its new champion, and dominates one more Sunday on the calendar before taking a few months off to sit back, count the profits and get ready to do it all over again. But thanks in part to one team’s alleged cheating and another team’s tense relationship with the media, the past two weeks for Goodell have been no different than the previous six months: The commissioner is still facing an unrelenting deluge of criticism and second-guessing, his integrity and competency being questioned every day as what was once a dictator-like power grip on the NFL appears to be weakening. The 2014 season was not a good one for Roger Goodell. His league generated negative press related to domestic violence and sexual assault cases, drug and alcohol abuse, brain injuries and long-term health problems, controversial officiating on the field, controversial conduct off the field, and the inexplicable existence of an NFL-approved racially insensitive nickname for the league’s Washington D.C. franchise. And that’s not counting the NFL’s quick escape from a potential religious discrimination scandal, which began when Kansas City Chiefs defensive back Husain Abdullah was flagged for an unsportsmanlike-conduct penalty after performing the Islamic prostration known as sajdah during a “Monday Night Football” game in late September. The league responded within hours that Abdullah should not have been penalized and saved itself from another public-relations black eye. As much as the players, coaches, referees, league employees and team owners responsible for the NFL’s incumbent black eyes were publicly taken to task by professional and social media for their behavior this season, Goodell himself has been under the heaviest scrutiny. In his 48-minute state of the league address on Friday, Goodell admitted this has been a “tough year” for him and for the NFL. The commissioner, however, remains optimistic. Some of Goodell’s critics believe he should be presiding over the NFL with the attitude of an athlete, keeping the players’ best interest top of mind. Others say he should be a pure businessman, making financial growth the league’s primary goal. And others will suggest Goodell be more of a cop, putting law and order above all else. But what if the NFL commissioner were to instead approach the job through the lens of a deeply religious person? Through the lens of a Muslim? Using religious principles to guide one’s professional decisions is almost as old as religion itself. But is that a feasible course of action for the leader of the world’s most popular and profitable sports league? Before answering that question, I hope to make it clear that I am not trying to cast aspersions on Roger Goodell personally, either as a commissioner or as a man of faith (whatever his faith may be). This piece is more about exploring where the values and principles of Islam fit within the culture of today’s NFL. First things first: I don’t think a Muslim NFL commissioner would allow the Washington D.C. franchise to keep its nickname. Islam is strongly against all forms of racism and bigotry — as detailed in the Qur’an (49:13) and in the Prophet Muhammad‘s final sermon, most notably — and is also strongly for kindness and compassion. Having a racial slur represent the league in such a prominent fashion, particularly a slur aimed at a group of people who have already been treated horribly in this country’s history, is a non-starter. And if franchise owner Daniel Snyder keeps up with his ignorant comments meant to defend his team’s choice of nickname, with a different commissioner he might find himself in a similar position as exiled former NBA team owner Donald Sterling. 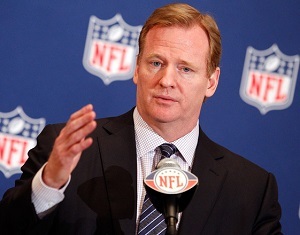 Player safety would be another high-priority issue for a Muslim NFL commissioner. While I don’t expect any NFL commissioner sell the old lie that player safety is the league’s first priority — if it really was, they’d change the game to flag football immediately — I would expect a Muslim commissioner to work within the framework of the sport as we know it to make things as safe as possible. Islam teaches its followers to love your fellow man as if he is your brother. And when it’s your brother’s health on the line, of course it will mean more to you. Therefore, with a Muslim NFL commissioner, I don’t think the league would have any more Thursday night games — a cruel bit of scheduling that forces some teams to play two games in five days — and I think the ongoing discussion about an 18-game regular-season schedule would cease. Another byproduct of a commissioner’s real commitment to player safety — as well as Islam’s prohibition on gambling — would be an end to the practice of injury reports being released publicly. Currently, NFL teams are required to release injury reports a few days before their game. And let’s be real: The only reason this is a rule is to cater to the gambling industry. Oddsmakers, bookies, prognosticators and gamblers need to know which players are hurt and to which extent they are hurt in order to make accurate picks and continue pumping money into the system. And as many people realized during another recent NFL scandal — the “Bountygate” case of the New Orleans Saints — NFL teams do pay attention to injury reports and will target the injured area of an opponent’s body. Requiring teams to hand over sealed injury reports to the league office is a smart and probably necessary policy in the name of protecting players from being taken advantage of by team doctors who have conflicting interests. But there’s no need for those reports to go public. By refusing to consider the desires of gamblers, and by essentially removing targets from players’ bodies, this way of handling injury reports would help reduce injuries and long-term health problems for players and former players. I also believe other injury-related policies — such as NFL rules regarding chop blocks and helmet-to-helmet hits — would regularly be reviewed by a safety-conscious Muslim commissioner, with the goal being that each athlete can walk away from this organized chaos we call pro football as healthy as possible. And keeping in line with the Islamic value of taking care of our elders as they once took care of us, retired players would also receive greater consideration regarding pensions and post-career health care. Drugs and alcohol are prohibited by Islam, and yet I don’t think a Muslim NFL commissioner would necessarily impose those values on the league’s players as strictly as some may expect. There is no compulsion in religion, according to Islam, and a commissioner’s duty is not to control the lifestyles that players live off the field. In other words, just because the commissioner conducts himself as a Muslim, that doesn’t mean he can require those he works with to behave as Muslims do. But if players do break league policies or societal laws, they will have to face consequences. Islam places a high value on qualities such as peacefulness, modesty, generosity, discipline, cleanliness, tolerance and honesty, among others. But a commissioner can only go so far without overstepping professional boundaries. Would a Muslim NFL commissioner, however, allow the league to continue advertising with alcohol companies and selling alcohol at stadiums? Ideally, they would not. But honestly, since the commissioner is technically working for each of the league’s 32 franchise ownership entities, it would be a very hard sell to get those owners to give up the tremendous chunk of money that comes with advertising and selling alcohol. And speaking of gameday atmosphere, what would a Muslim commissioner do (if anything) about NFL cheerleaders? About rude and unruly fans? Would more NFL stadiums have prayer and meditation rooms for religious fans? The ideal Muslim NFL commissioner would approach contract and collective-bargaining negotiations from a place of fairness and avoid being needlessly greedy. So under this commissioner, is the likelihood greater that the 2011 NFL player lockout or the 2012 NFL referee lockout would not have happened? Would labor peace be more likely with a Muslim NFL commissioner? There is no question, however, that the hottest of hot-button topics Goodell and the NFL faced in the past year has been domestic violence. The league had dealt with cases of players assaulting women in the past, but often those were handled quickly and relatively quietly. Things changed in 2014. The case of former Baltimore Ravens running back Ray Rice was, depending on who you ask, either a shocking eye-opener or a long overdue last straw when it came to football players and domestic violence. Rice, who was caught on video knocking his wife out with a punch and then dragging her unconscious body from the scene, has been vilified by the public and media more than perhaps any athlete since O.J. Simpson. Meanwhile, Goodell’s handling of the Rice case has drawn the kind of negative attention and criticism that transcends the sports page. And then just when it seemed the Rice story was fading from public consciousness, Minnesota Vikings superstar running back Adrian Peterson was indicted on child-abuse charges for allegedly beating his four-year-old son in an excessive manner. Peterson’s ensuing suspension was more strict and swift than Rice’s punishment — the NFL had learned a lesson, after all — but Goodell and his league were again painted in a negative light. Domestic violence is also a controversial topic in the Muslim community. Although there are multiple hadiths quoting the Prophet Muhammad (peace be upon him) on family life and describing him as a gentle husband and father — “The most complete of the believers in faith, is the one with the best character. And the best of you are those who are best to their women,” the Prophet said — there is still a disturbing and persistent culture of domestic abuse in many Muslim-majority countries and communities around the world. And the actions of those abusers support the misconception that Islam encourages domestic violence. Would a Muslim NFL commissioner have handled the Rice case or the Peterson case any differently than Goodell handled them? Given the importance that Islam places on justice, I think that if nothing else, Rice’s initial suspension would’ve been longer than two games given the contents of the infamous videotape, even if Rice had not been convicted in a criminal court. In the aftermath of the Rice and Peterson cases, the NFL began working on a tougher personal conduct policy, which it is now fighting with the NFL players union to implement sooner than later. It is an admirable effort that will lead to a better league, insha’Allah. But I feel that under a commissioner who is following Islamic principles, a tougher conduct policy would’ve already been in place before Rice and Peterson damaged the league’s reputation and deep-pocketed sponsors started questioning their affiliation with the NFL. Of course, it is unfairly easy to criticize the actions (and inactions) of people who are in high-profile decision-making roles: men like Roger Goodell and Barack Obama, women like Angela Merkel and Stacey Allaster. We not only have the benefit of hindsight, but we also don’t face the coming-from-all-corners pressure these leaders live with every day. While it seems everybody with even a casual interest in football is lining up to tell Goodell how to do his job, I don’t think anyone is under the illusion that his job is an easy one. The commissioner of the NFL must serve the interests of billionaire team owners without alienating millionaire athletes. The commissioner must manage the egos of rich, talented and confident men and women who are accustomed to getting their way, all while maintaining goodwill with a mostly working-class fan base whose money makes the entire system go ’round. The job of NFL commissioner requires an ability to balance justice with fairness, confidence with humility, forgiveness with accountability, patience with ambition, strength with kindness. It is a balancing act that many Muslims have experience in navigating; a job at which I would fully expect the right Muslim to succeed.